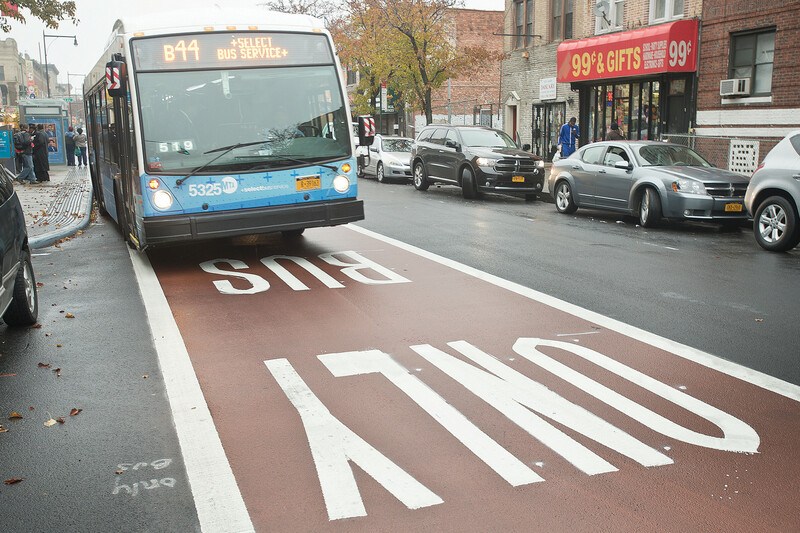 Red or terra cotta colored pavement highlights the prominence of the transit system, while at the same time visually enforcing dedicated transit space. Implementation of “red carpet” treatments in different contexts have reduced vehicle incursions by 30–50%, supporting on-time performance and reliability. Currently, color treatments require an experimentation request. “Official Ruling 3(09)-24(I) – Application of Colored Pavement: Aug 15, 2013.” Manual on Uniform Traffic Control Devices, 2009 Edition. Federal Highway Administration (2013). Coloring application depends upon factors such as climate, use and stress, and age and condition of pavement. 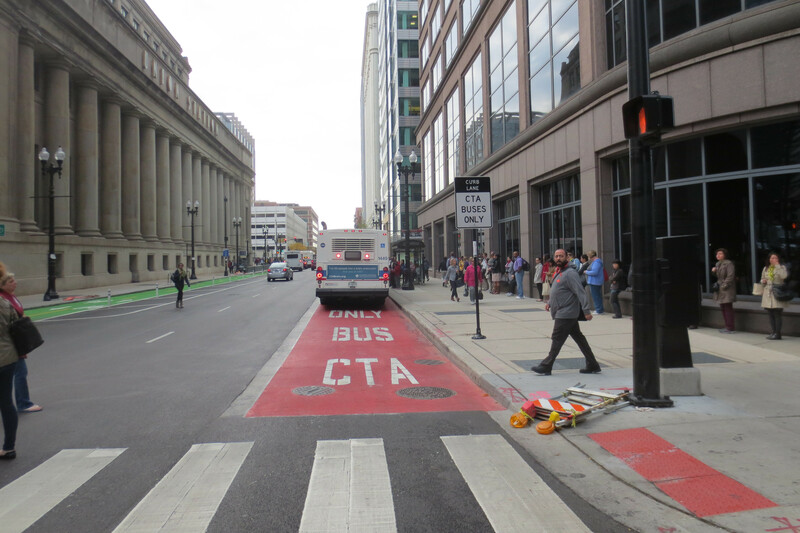 Red color application on Church Street in San Francisco improved corridor travel times 14% for buses, and reduced travel time variability 27%, with negligible impact on vehicle travel times. Church Street Pilot Transit Lanes. San Francisco Municipal Transportation Agency (2015). Epoxy-based paint is a widely available semi-durable marking material. As with other paints, glass beads and sand can be added for retroreflectivity and skid resistance. 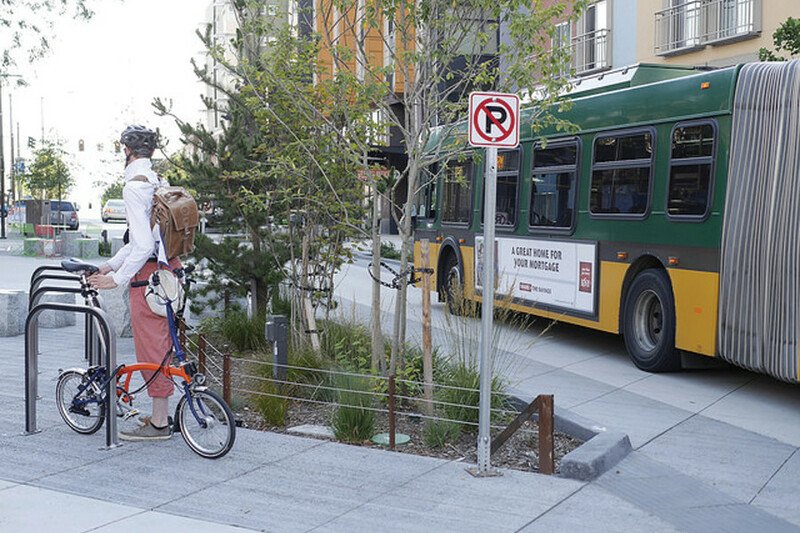 These components should be prioritized near crosswalks and on shared bus-bike lanes. When possible, apply after resurfacing; paint adheres best to new asphalt, especially for epoxy paint. On existing pavement, aggressive pre-treatment (power-washing and shot-blasting) can increase adherence and performance. Red thermoplastic provides a consistent colored surface, and in amenable conditions has a low life-cycle cost. It applies well to almost-new and slightly worn asphalt. 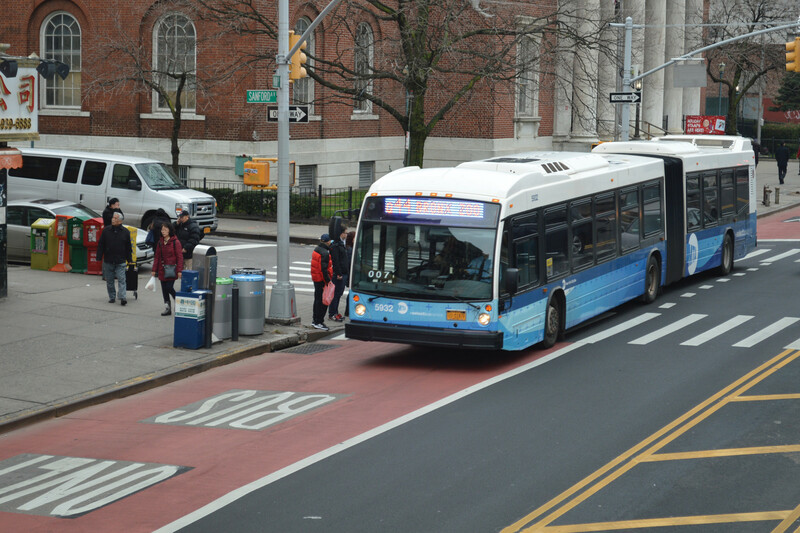 However, it may need frequent replacement under high volumes of heavy vehicle traffic, common on bus lanes. Cold-weather climates and some varieties of concrete can also limit the lifespan of thermoplastic. Thermoplastic can be applied to any surface but is most effective when applied to asphalt, and may have limitations bonding to concrete or in cold climates. Anti-skid treatments can be applied to thermoplastic. Methyl methacrylate (MMA) is an advanced polymer with better wearing than traditional thermoplastic, and may have a lower life-cycle cost, especially under heavy vehicle loads and when snowplowing is frequent. 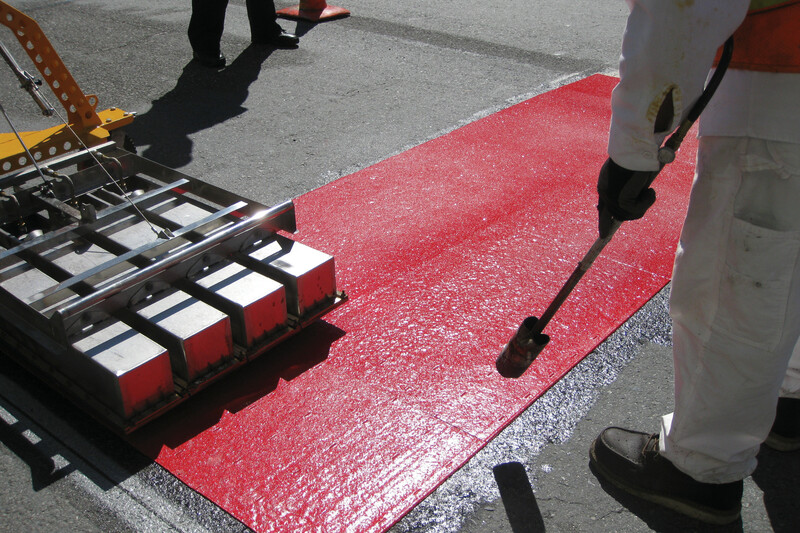 Asphalt or concrete can be mixed with a red pigment, eliminating the need to reapply a red colored surface treatment. Tinted asphalt uses special aggregate and binder. Tinted asphalt materials and implementation costs are somewhat higher than for untinted asphalt, but prevents multiple reapplications of color. Repairs, such as patching and pothole filling, as well as utility trenching, complicate the use of embedded color, as repair materials must match or be colored to match the pavement. Colored microsurface pavements have shorter life cycles, especially in harsh or snowy climates; color should be mixed through the entire top concrete layer. High Friction Surface Treatments (HFST) can be embedded with colored glass to provide a distinctive and durable surface even when repaving is not possible. HFST can enhance both bus and bike traction on curves or downhill sections. 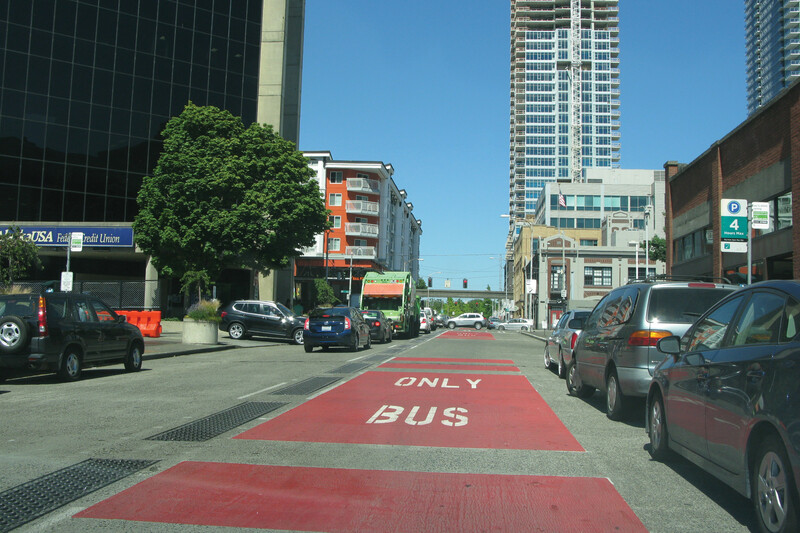 Where red lanes are not employed for the length of a transit lane segment, a solid red stripe can highlight key sections of a transit lane such as stops or sections with turn prohibitions, which help to self-enforce lane restrictions. To save the expense of applying red color to entire road segments, a red thermoplastic or painted backing can be applied around the “BUS ONLY” lane markings. The backed message may not have the passive enforcement value of a completely red lane, but can increase the visibility of the restriction. 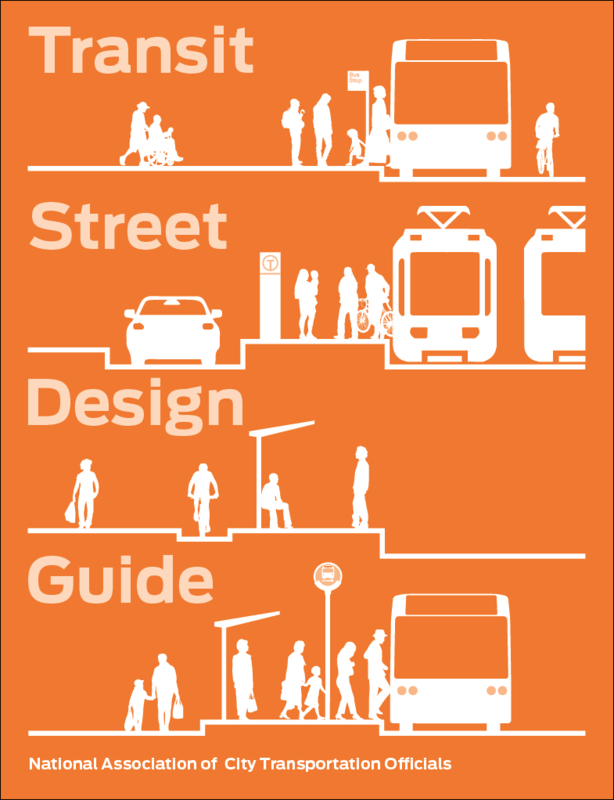 Color variations subtly suggest street space and modal zones while increasing the use of space by people on foot in shared environments. High contrast enables people with low vision to distinguish between two spaces, including two spaces at the same grade. Lighter colored pavers and concrete that have higher solar reflectance (albedo) can help maintain a cooler, more comfortable street environment. “EPA Cool Pavements Compendium.” US Environmental Protection Agency (2015). Unit pavers of a variety of sizes and colors can be used in on-street railbeds to designate the streetcar path. Use different colors, orientation, or texture of pavers to designate the edge of the travel path and discourage other vehicles from entering or blocking. On routes where the bus is not limited to a fixed path, select large paving blocks, as smaller pavers are subject to shifting under the weight of a bus. Where a bus is provided a fixed path, concrete or large pavers can be used for the path of the bus wheels, with smaller paving blocks adjacent to the running way and between the two running courses, forming a visual guideway.